The countries of South America are uniquely special, and the continent so vast. Unless you have months to devote (and if you do I am incredibly jealous), you must maintain a narrow vision of what ground you hope to cover in two weeks. We agonized over the decision, eventually choosing two special sites, essentially two separate trips, some 3,400 miles apart. 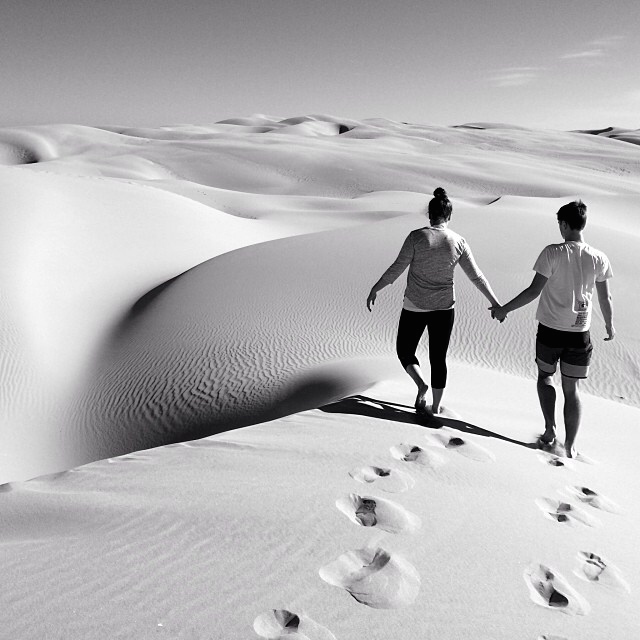 It physically pained us to not see the Bolivian salt flats and oasis and towering sand dunes of Huacachina. But we consoled ourselves with the unparalleled ruins of Machu Picchu and unrivaled beauty of Patagonia. When traveling to South America, it is important to note that the continent lies in the southern hemisphere. Depending on where you are traveling from, the seasons may be diametrically opposed. For example, our pre-Thanksgiving November was their late spring/rainy season, bringing warm weather and humidity to Peru and “warmer” weather to Patagonia. We selected two destinations largely frequented by foreign tourists so language, or rather our inability to speak proficient Spanish, was not a deal breaker. 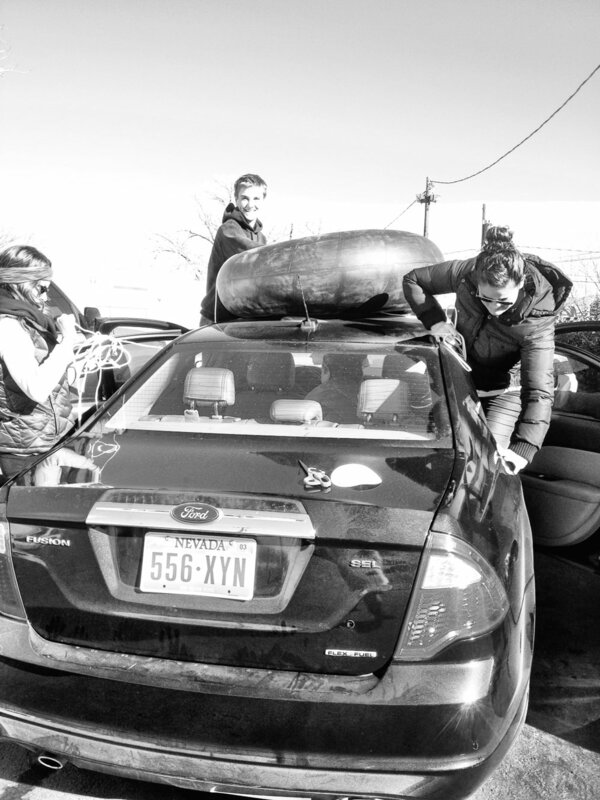 For the most part, we were able to navigate and communicate just fine. All tours were available with English-speaking guides. Because we were venturing beyond major cities, I consulted my local travel clinic for inoculation advice. The CDC website is also a valuable resource. I received vaccinations for tetanus and typhoid fever. I was also prescribed Diamox for altitude sickness and Cipro for traveler’s diarrhea, respectively. The former was taken a couple days before traveling to high altitudes and daily while there. Fortunately, the latter, only filled in an abundance of caution, was not needed during our stay. Please consult your doctor before beginning any new medications. And invest in bottled water while abroad. We flew from LAX to Lima with a layover in the international hub of Mexico City. We arrived in Lima the following morning and lingered at the airport before boarding an early morning flight to Cusco, the nearest major airport to the Inca city of Machu Picchu. LAN has inexpensive, direct flights nearly every hour. Flying over the Andes Mountains is a spectacular sight. At cruising altitude, the mountains are so close, so imposing. Cusco is a small, busy town nestled in the Peruvian Andes. Formerly the capital of the Inca empire, Cusco is known for its archaeological remains and Spanish colonial architecture. Set at an altitude of 11,152 feet(! 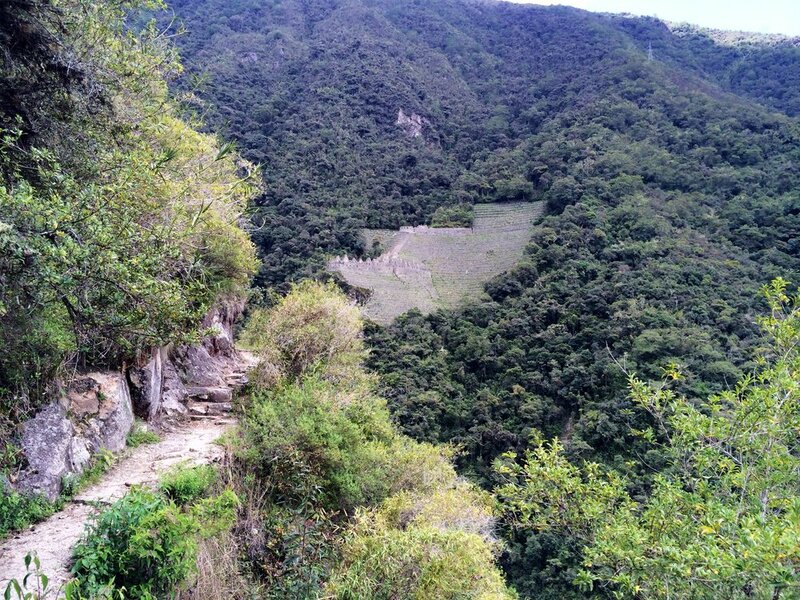 ), it’s the gateway to the Inca Trail, a multi-day trek that ends at the mountain citadel of Machu Picchu. It is recommended that you spend a day or two in Cusco before continuing to Machu Picchu in order to adjust to the conditions. Immediately upon deplaning, I do not feel well – a sickening combination of dehydration, exhaustion, plane food, and altitude. In the airport, a throng of vendors (some selling goods and services, others advertising tours and rental cars) accosts you. Each establishment offers a little basket of dried leaves. These are coca leaves, an all-natural psychoactive alkaloid (read: cocaine). The leaves, which are either chewed or brewed, act as a stimulant and effectively combat altitude sickness. In desperate need of both, I grab a handful and my luggage, and make for the exit. We take a taxi to our accommodations in the center of town. I cannot recall the going rate for the twenty-minute ride to the city center. I am certain we overpaid, but still not very expensive. We proceed to Hotel Rojas Inn. Our private double room with en suite restroom was perfectly nice. The comfortable, open lobby featured a coffee and tea cart and more coca leaves. Perhaps an indication of the lack of oxygen circulating to my brain or my addictive personality, I had a steaming cup with me at all times. The tea and its psychotropic properties wonderfully focused my mind and body for a full day of sightseeing. We had all day to see the Cusco sights and acclimate before making our way to Machu Picchu and the bordering town of Aguas Calientes. First things first, we proceed to the Llama Path office (250 San Juan de Dios Street) to settle the final balance and get briefed on our trek. Cusco’s main downtown area is small and walkable. Beware of the traditionally dressed women with llamas. You will get a great photo but nothing in this life is free. Delicious early dinner at Incanto, seamless combination of Italian and Peruvian cuisines. We were departing for our two-day Inca Trail trek early the following day. The hotel kindly allowed us to stow our heavier duffel bags for the two days we would be gone, enabling us to take only the bare essentials for our backpacking journey. Llama Path van picks us up dark and early at 5:00 a.m. We drive for hours across the countryside, viewing the sunrise from the road. In Ollantaytambo, we board Inca Rail, an upscale direct train that winds through lush landscapes en route to Aguas Calientes. About halfway to Aguas Calientes – km 104 to be exact – the train slows to a stop, signalling our queue to disembark in the middle of the jungle and begin hiking. Our guide, Alice, leads the way. 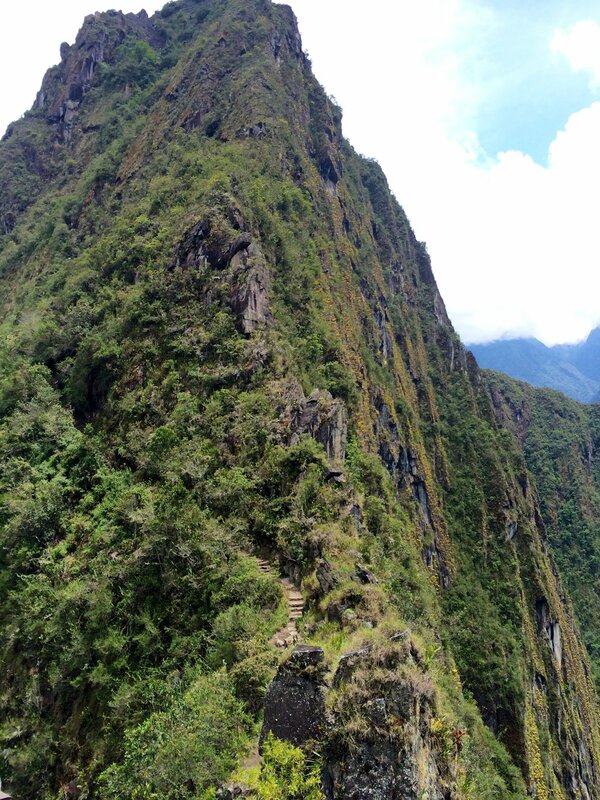 The 7-mile hike, along the most impressive stretch of the Inca Trail, unimpressively took most of the day. The trail is steep and the altitude debilitating. I could never catch my breath. 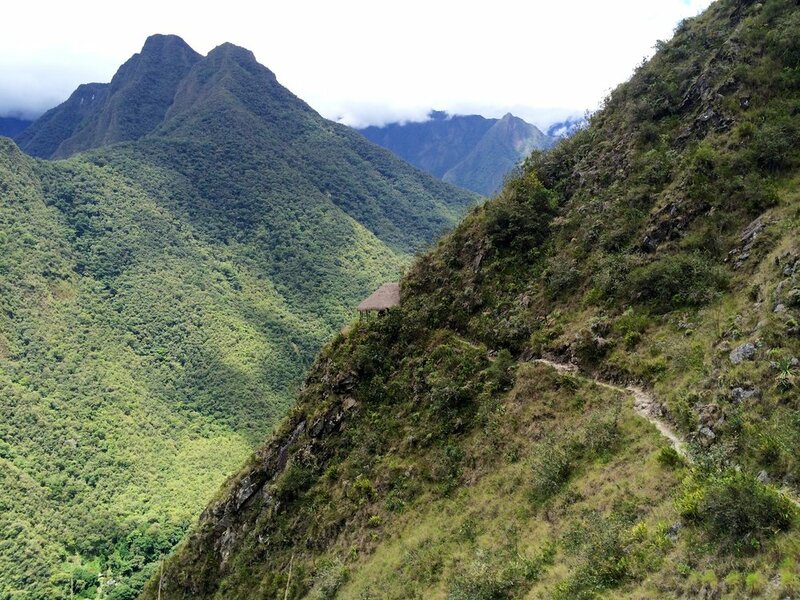 We observe other Inca sites along the way, impossibly carved into the staggering mountains. I cannot possibly describe the height and scope of the Andes. At the halfway point, we enjoy the box lunch provided. Our slow pace proved fortuitous: arriving at the Sun Gate during magic hour, the daily visitors cleared from the park, was an incomparable sight. The sublime view took my breath away. And, for once, the altitude was not to blame. After we passed through the Sun Gate, we proceeded on the trail a little way before taking a side trail leading to Aguas Calientes in the valley below. We were so exhausted from the journey, we opted to take the short bus ride from Machu Picchu to Aguas Calientes instead. Although, there does exist a walking route to town. We checked into our hotel and freshened up. Night one accommodations and dinner were included with the trek. Alice takes us to an average restaurant, where we have a selection of entrees. BYOB – drinks are not included. Aguas Calientes, also known as Machu Picchu Pueblo, lies in a deep gorge below the ruins of Machu Picchu. Only accessible by train, it is cut off from all roads and enclosed by stone cliffs, towering cloud forest, and two rushing rivers. Las Termas hot springs are a short walk up Pachacutec from the train tracks. These tiny, natural thermal springs, from which Aguas Calientes derives its name, are nice enough for weary trekkers to soak their aches and pains. Towels can be rented for a small fee outside the entrance. I cannot recommend Llama Path highly enough. Our guide was wonderful, knowledgeable, patient, and a photography enthusiast. It was just the three of us. Each group is given their own guide and personal attention. 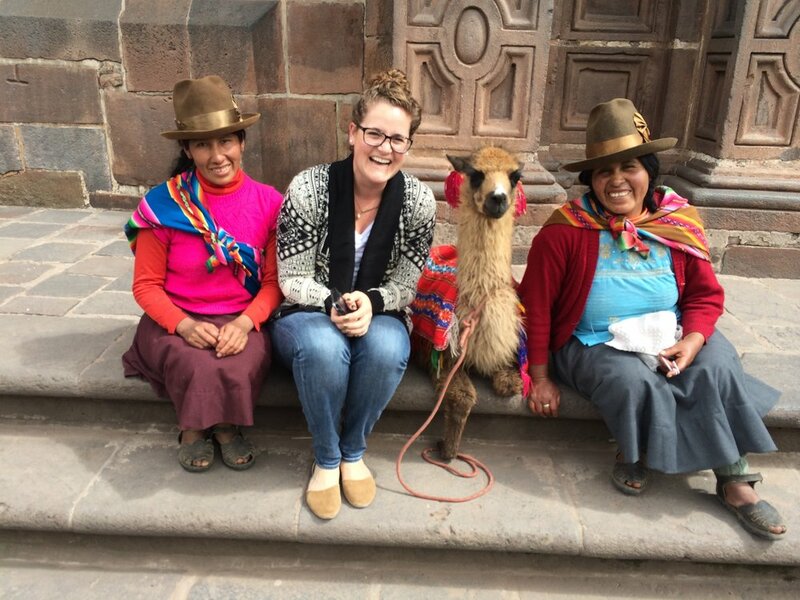 Alice was born and raised in Cusco and led groups along the Inca Trail multiple times a week. 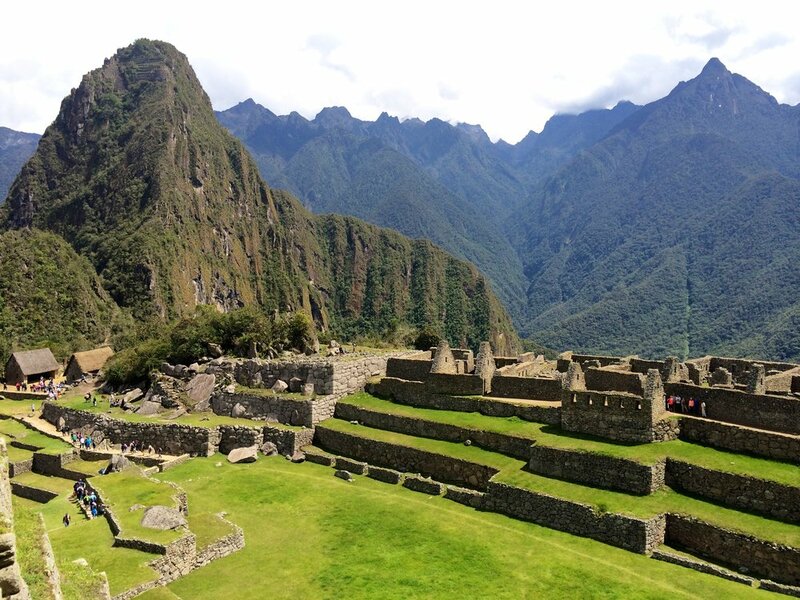 Due to heavy use and subsequent environmental impact, Machu Picchu, the surrounding sites, and the Inca Trail are heavily regulated by Peru’s Ministry of Culture. It is impossible to hike the trail independently. You must travel with an authorized guide. There are two-day and four-day trekking options. The experience is not to be missed. When in Peru, do as the Incas do. Llama Path worked with us to create a personalized itinerary. 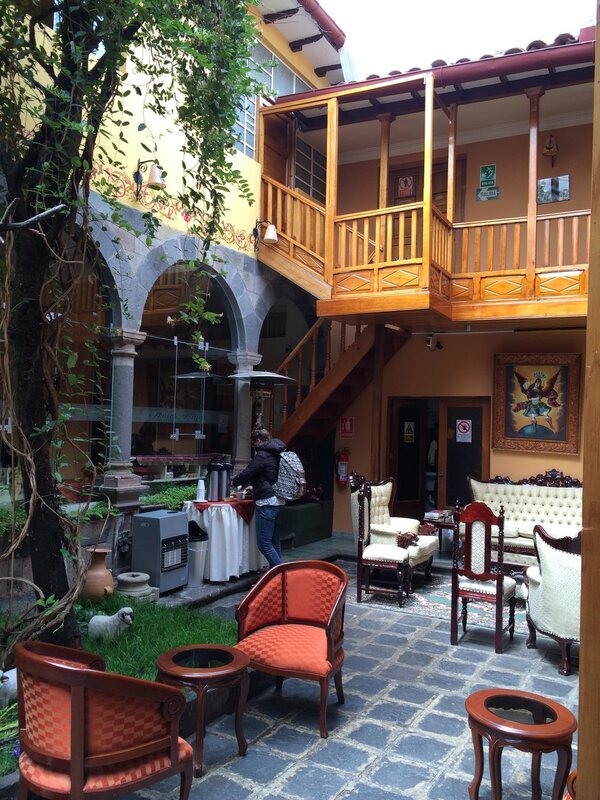 We elected to stay an extra night in Aguas Calientes, booking our own hotel accommodations that second night. Llama Path took care of everything else: transportation from Cusco to Ollantaytambo (and back), round trip train tickets, Inca Trail permits, Machu Picchu bus tickets and entry, Wayna Picchu permit, night one accommodations, and some meals. And Alice made sure we got these amazing stamps in our passports! If you just want to visit MP for the day, then you can proceed alone or with a guide. The process is very accessible and organized. 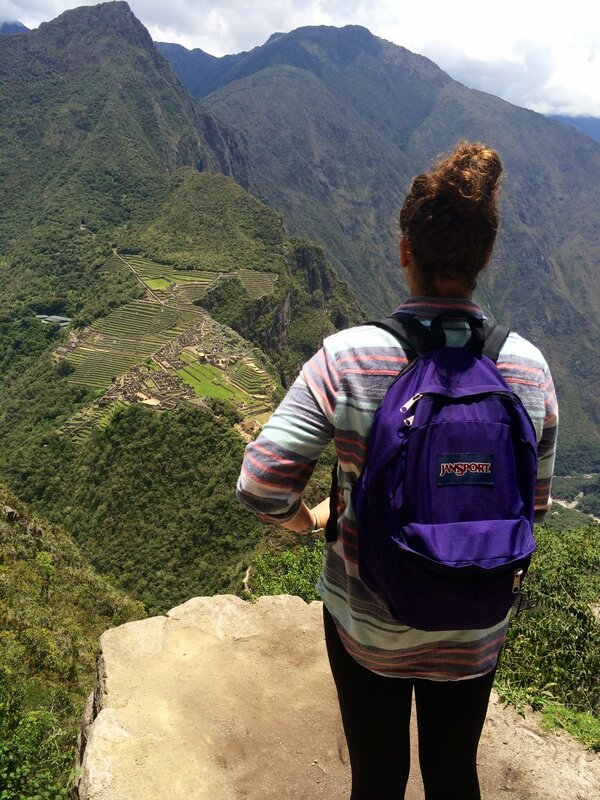 Today we would actually explore Machu Picchu. 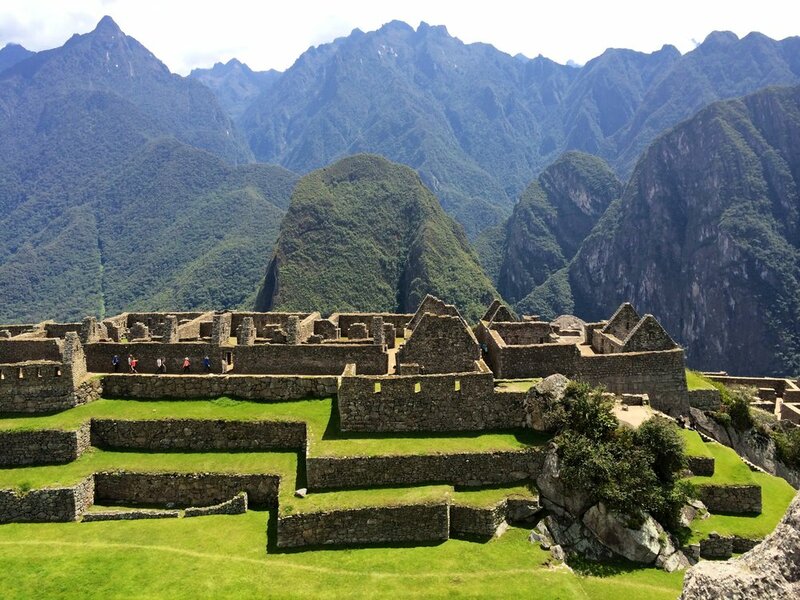 At 7,970 feet above sea level, Machu Picchu is at significantly less elevation than Cusco. I noticed the decreased oxygen, but did not experience altitude sickness symptoms like in Cusco. This goes for the Inca Trail, as well. Buses frequently run between downtown Aguas Calientes and the Inca citadel. After complimentary breakfast buffet at the hotel, we take the first bus up the hill. We left one bag at the hotel and carried one daypack between us. Alice gave us a two-hour guided tour of the grounds. She told us about Hiram Bingham, the first Western scholar to lay eyes on the “lost city” in 1911; about how the stones, cut without technologically-advanced tools, fit together so tightly that the cracks cannot be penetrated by a knife; about religion and spirituality; about man-made and mountainous landmarks that appear to align with astronomical events like the solstice sunset. The city was thoughtfully laid out and constructed. Every structure had a logical purpose and religious justification. 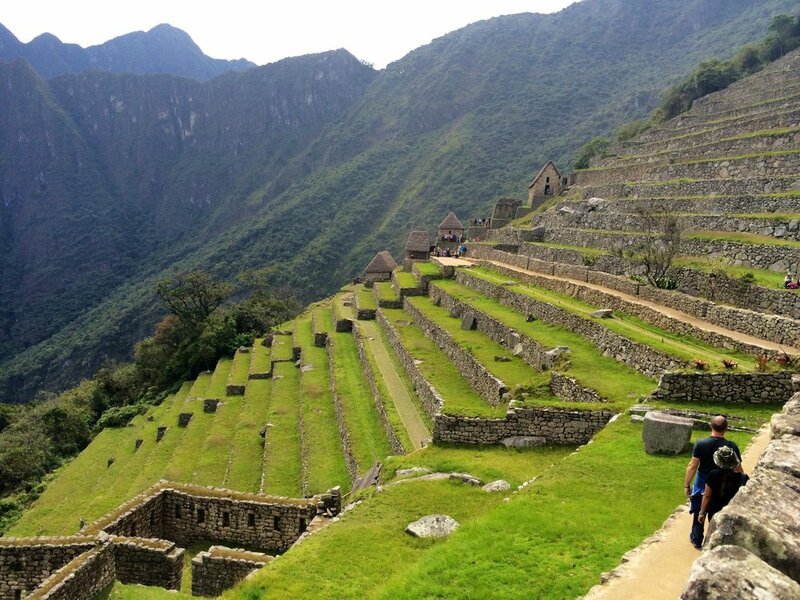 In Machu Picchu, everything happened for a reason. Today, workers are constantly preserving the site. And llamas maintain the perfectly trimmed lawn. We said our goodbyes to Alice, and set off to hike Huayna Picchu. The hike, accessible by permit only, has two departures per day at 7:00 a.m. and 10:00 a.m. Each departure is limited to 200 tickets. You will sign in and out at warden’s hut as you enter and exit the path. Bring your passport. The hike is moderately challenging with a climb of 1,158 feet. I would not recommend the hike for those afraid of heights. In places, the trail is very steep. This is particularly true immediately after the summit where the trail descends through a series of steep and narrow stone steps. I cannot stress this enough: take more food and water than you think you will need. We had a couple bottles of water and ran out shortly before reaching the lookout. This made for an anxiously rushed hike down. Just outside the citadel, there are restrooms and a snack bar, where we were able to rehydrate. In a fit of desperation, we abandoned the day’s remaining exploration of the city and returned to town. Only in retrospect do I wish we had regrouped and gone back to explore the Inca Bridge and other notable structures. Back in AC, we collected our belongings and checked into Hotel Wiracocha Inn. Finally rebounding from the day’s dearth of drinking water, we explored the city center and marketplace near the train station. We had dinner at a charming restaurant overlooking the main plaza. That night, a huge storm rolled in. We fell asleep to the sounds of pounding rain and roaring thunder; the sights of lightning flashes and Gattaca in Español. Para alguien que nunca tuvo la intención de este mundo, debo confesar repente estoy teniendo un tiempo difícil salir de ella. Hotel offered beautiful breakfast with fresh fruit, juices, and scrambled eggs. And with that, the dreaded travel day commenced. Train from Aguas Calientes to Ollantaytambo. Llama Path arranged transport from from Ollantaytambo to Cusco. Driving across the Peruvian countryside, I only saw women in the fields. Dressed in boots and leggings, skirts or dresses, cardigans, and flat brimmed hats. Their long dark hair in two perfect braids. My new style icons. In Cusco, we grabbed our luggage and took a cab to the airport. Airport departures is quite a (clears throat) departure from the scene at arrivals. Nice dining options and duty-free shopping. There was a big storm coming in. Our flight to Lima was delayed. We just barely made it out of town. Back to back to back, we flew from Lima to Buenos Aires to El Calafate, Argentina. Our airfare was a combination of three round trip flights: LAX/LIM (layover in Mexico City) on Aeromexico; LIM/CUZ on LAN; LIM/FTE (layover in Buenos Aires) on Aerolineas Argentinas. Please refer to Patagonia post for chapters six through twelve. Our final day down South America way was spent in Lima. We spent the night at the Mariel Hotel in Miraflores (the garden district), one of the more upscale residential and shopping districts in the city. The hotel offered complimentary breakfast. With no particular agenda, we just felt like walking: down the tree-lined Avenue José Pardo to the many Playas and Parques of Miraflores; from Huaca Pucllana, the only pre-Inca ruin remaining, to the bustling outdoor stalls of the Indian Market. We sampled lomo soltado. We took a taxi, amid rush hour traffic, to the beautiful Municipal and Government Palaces. We ordered pisco sours at historic Gran Hotel Bolivar. And window shopped along Jirón de la Unión. The streets were packed, a pickpocket’s playground. After the natural wonders of the world, I found this huge city grating and over-stimulating. Lima boasts an impressive coastline. Bluffs looking out over the Pacific Ocean and Peruvian Pacific Coast Highway below. This area of Lima is famous for its parasailing. Solo and in tandem, adrenaline junkies run right off the Malecón and ride the winds. For obvious reasons, the weather conditions have to be just right. And, this day, the winds were too calm for us to partake. The saving grace in this sea of travelers and traffic was the fresh seafood and local cuisine. We had the most incredible ceviche (“cebiche” to Peruvians) in one of the most unexpected neighborhoods. The restaurant menu is modeled on the seven deadly sins. And I’m being hyperbolic here, but I would kill for that ceviche right now. I think I’m being unfair to Lima. The city is nice. The jolt of the capital. Peru’s political and cultural epicenter. But the natural beauty and quiet of Perito Moreno and Torres del Paine marked a shift in my traveling philosophy. Urban spaces, no matter the country, are so often interchangeable. There is a time and a space for big cities. Heck, I live in one. Now I was seeking something different. I desired wild open spaces, the high of natural wonders (and coca), the most beautiful places on this planet. The metropolitan Lima just couldn’t give me what I needed. It’s not Peru, it’s me. We dearly depart. We chill at hotel, take a taxi to the airport, and leave on the red eye from Lima to Mexico City. Amazingly enough, in Mexico City, we were able to jump on an earlier flight to Los Angeles. Once again amidst the hustle and bustle of city life, treasuring the fleeting tranquility and seeking our next fix.